Two versions of a man stand opposite each other on stage. One is young, full of dreams, and grinning so hard he could almost levitate. The other is old, still, and puzzling over memories he can barely hold onto in his mind. 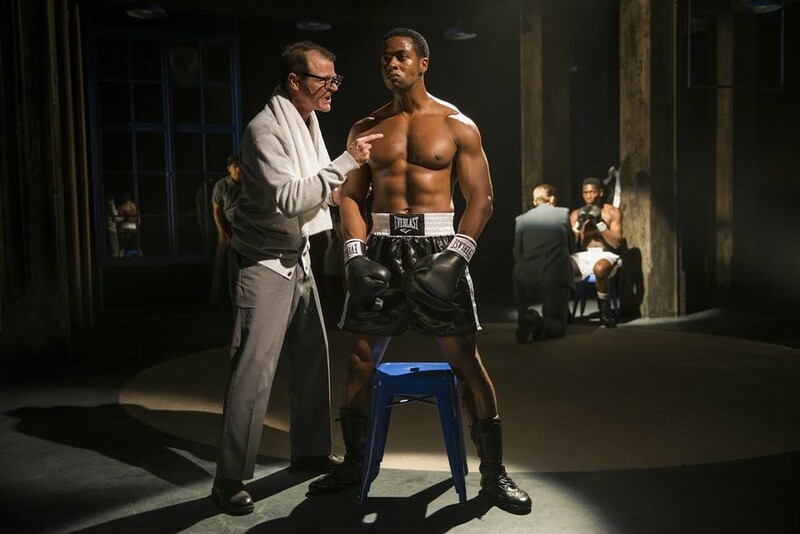 This is the scene set in the Court Theatre’s Man in the Ring by Pulitzer Prize and Tony Award–winning playwright Michael Cristofer, a gripping world premiere that throws viewers into the world of boxer Emile Griffith. Tensions of guilt, love, and identity course through matches both physical and mental. Emile Griffith was born in the U.S. Virgin Islands and was discovered while working in a hat factory after moving to New York City. The factory owner, Howie Albert, recognized Emile’s strength and encouraged him to become a professional fighter. Emile, portrayed in his youth by Kamal Angelo Brown, once dreamed of playing baseball, singing, and designing women’s hats. Under Howie’s training, however, he soars. Though hardened in the process, Emile embraces his new career—fraught by tension due to his bisexuality—to provide a new life for himself and his immigrant mother. In Man in the Ring, Emile reflects on these early days from an older age, as portrayed by Allen Gilmore. He attempts to piece together his experiences but struggles with the effects of dementia pugilistica from injuries sustained during his career. As a result, Emile’s history and identity remain a tangle as his younger and older selves engage in dialogue. As the narrative unfolds, Emile is forced to face his own capacity for violence and rage even as his own brain and memories deteriorate. The ensemble cast, under the direction of Director Charles Newell, blends Emile’s memories and emotions with dynamic staging and singing. The result is complete immersion in the narrative, rather like the boxing ring itself with all its conflict, anger, and high stakes. This play has a special kind of resonance; every poignant picture made on stage had a way of echoing throughout the piece and even past the final bow. Newell told Playbill, “We have dreamed of Court Theatre being a place where distinguished artists are willing to bring their newest and most daring work.” With Man in the Ring, this dream was made an undeniable reality. In its closing weekend, the show continued to draw large and appreciative audiences. With Man in the Ring, the Court Theatre promises another season of bold truths and emotions through acting. See Court Theatre’s upcoming show Electra by Sophocles, November 10–December 11. Student Night is Friday, November 18, 8 p.m. featuring free food. $15 tickets with UCID. $5 student rush tickets one hour before show.